Mophie, known for its juice pack cases that combine device protection with an embedded battery, is now offering the H2Pro juice pack for the larger 5.5-inch iPhone models. This accessory adds IP68 certification, allowing the Apple iPhone 6 Plus and Apple iPhone 6s Plus to be submerged in water as deep as 1.2 meters (3'11') for up to 30-minutes. The case also makes the iPhone models dust resistant. The Mophie juice pack H2Pro is equipped with a 2950mAh battery, increasing the run time of the iPhone 6 Plus or iPhone 6s Plus by as much as 70%. It will provide up to 14 hours of additional talk time (so you can discuss the merits of Apple's defiance of the court order) or 11 hours of addition video watching time (that means roughly 11 additional episodes of House MD). The case itself is no slouch, either. Like the LG V10's regular body, the H2Pro offers Military Standard 810G level of protection. This means that your iPhone 6 Plus or iPhone 6s Plus is protected from a fall or drop from as high as 3'11'. The case also guards against vibrations and shocks. And you will still be able to access Touch ID thanks to a scratch resistant membrane. 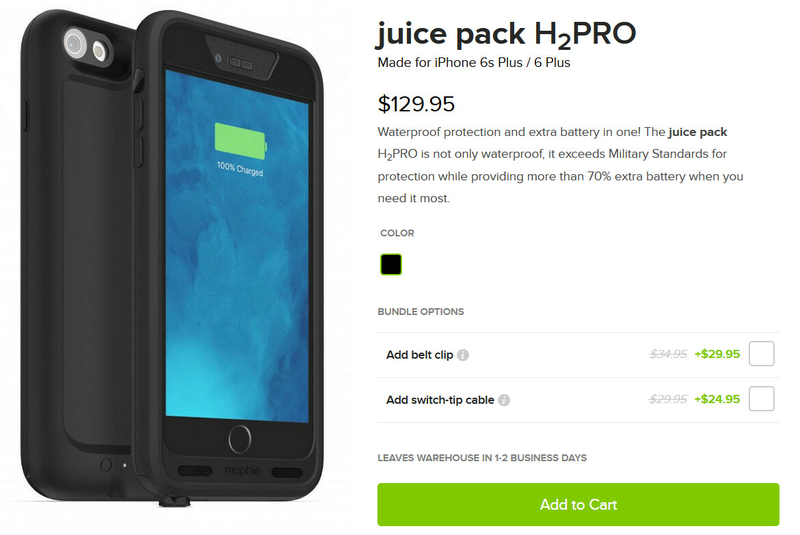 The Mophie juice pack H2Pro is a bit pricey at $129.95. But the first time you drop your iPhone 6 Plus or iPhone 6s Plus, or water spills on the device, you'll probably be thinking that it is worth every penny. If you are interested in protecting your Apple iPhone 6 Plus or Apple iPhone 6s Plus, click on the sourcelink. Exactly bruh. What do you think about this, https://www.youtube.com/watch?v=QmoVuQnvjqQ. Crazy right, I don't care if you are rich it's stupid to buy such an expensive case, that doesn't even protect your whole phone. Why buy an inferior product? You still don't know everyone need battery life, good design, in a thinner devices? Who will care about this if there is going to be a waterproof nex gen iPhone Plus with a huge battery, running on ultra-efficient components ? Nobody.